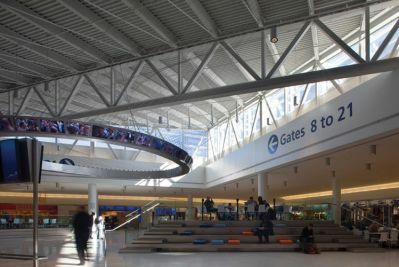 JetBlue representatives stated that customer experience is greatly improved when passengers can easily navigate through their terminal. The Port Authority of New York and New Jersey (PANYNJ) dictates the signage guidelines in terms of colors, type, letter heights and materials. Yellow signage is used to specify flight information, black for airport services, green for exits and grey for general information. The purpose of such guidelines is to add consistency within transportation to allow users to navigate more easily. The ceiling directional’s used a variety of materials including aluminum, Dibond, vinyl and steel, fabricated by MSD Visual. Services available off the concourse, such as elevators and restrooms, were indentified with Sintra board signs in aluminum brackets. 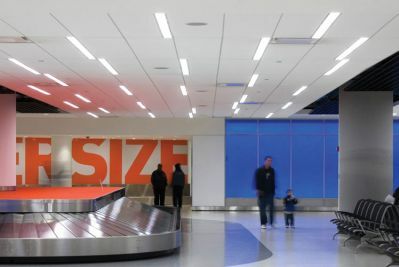 Gensler and JetBlue showcase the ability to represent your brand’s identity with environmental graphics and signage design.